As a developer, I had a requirement that a Word document should be created for my last project. This article presents how to create a rich content Word file and convert it to PDF using Free Spire.Doc in C#. I had a requirement that a Word document should be created for my last project. The biggest challenge was that Microsoft Word might not be installed on the machine. Basically, there were a few Word components to perform a wide range of document processing tasks without Microsoft Word installed. I chose Free Spire.Doc as it is free and easy to use. And considering the expertise I had with this component, I decided to go with it. Below you can see that how I created and manipulated a Word document. 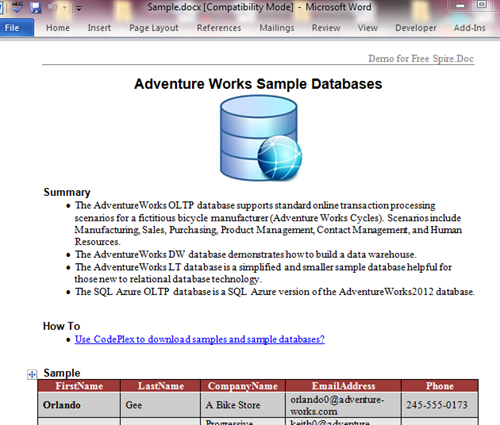 I also used some data from Adventure Works Sample Database which is produced by Microsoft to fill a table. 3.Insert text, image and hyperlink. 4.Insert table and apply built-in style. Firstly, I created a Document with Section. Then I inserted header/footer with some texts inside (image also supported). Then the body was added which had many paragraphs and images. I also set bullet style in some paragraphs. Free Spire.Doc also supports add a table to document. 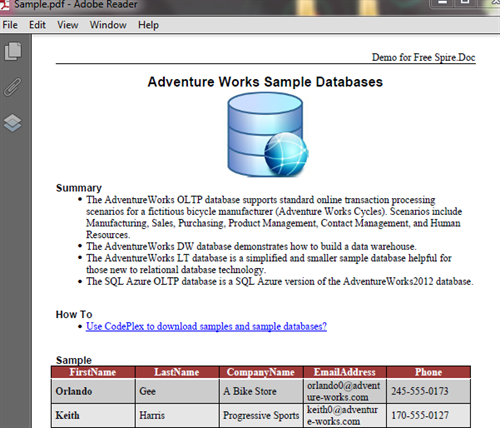 So I created a table and inserted some data from AdventureWord Database to display, the result show is excellent. You can also save the document as a PDF document via little code changed. Really nice article Tony sir, it will boost up word automation.